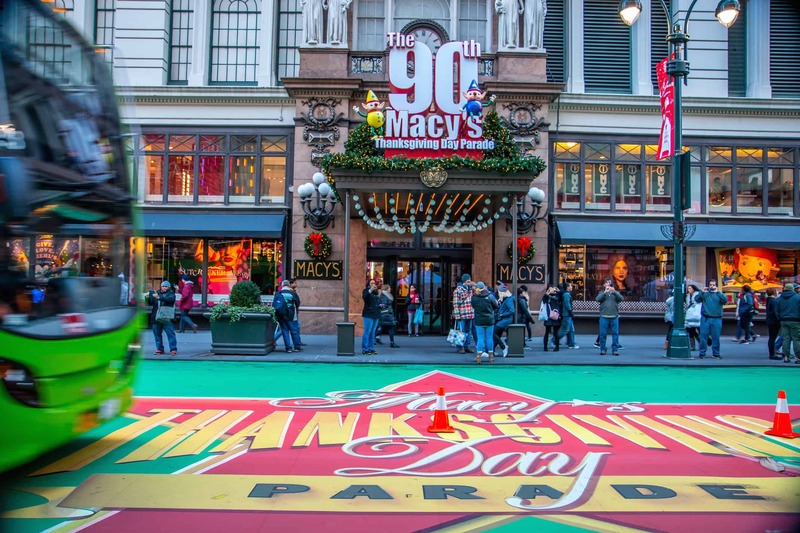 I’ve been dreaming of seeing the Macy’s Thanksgiving Day Parade ever since I was a young boy, watching the annual broadcast from the cozy comfort of my family’s living room in Atlanta. Despite the fact that it took me 48 years to make that dream come true, there was no shortage of child-like awe and wonder as Mary, my daughter and I made our way into New York City on Wednesday for a marathon 24 hours in the Big Apple. Macy’s Herald Square was our first stop after we arrived at Penn Station. 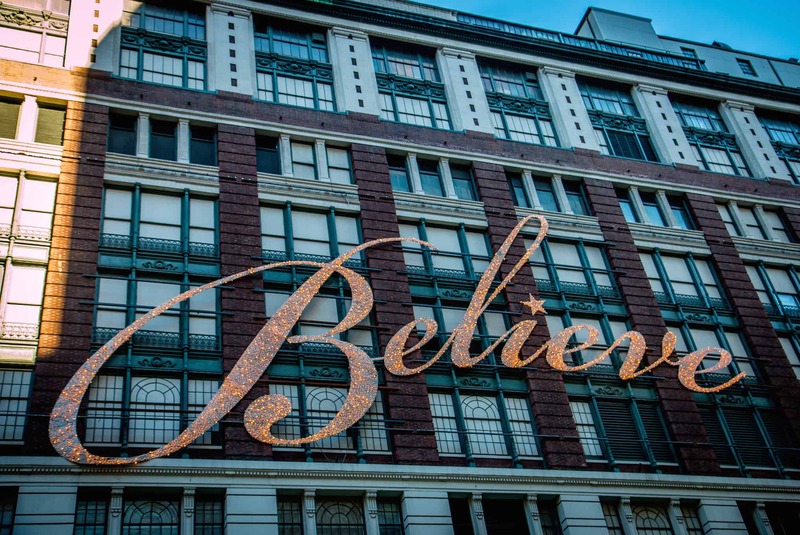 I couldn’t stop grinning at the famous star in the middle of 34th St, the glowing “Believe” sign, the massive Virginia (as in “yes, there is a Santa Claus”) atop the storefront awning. 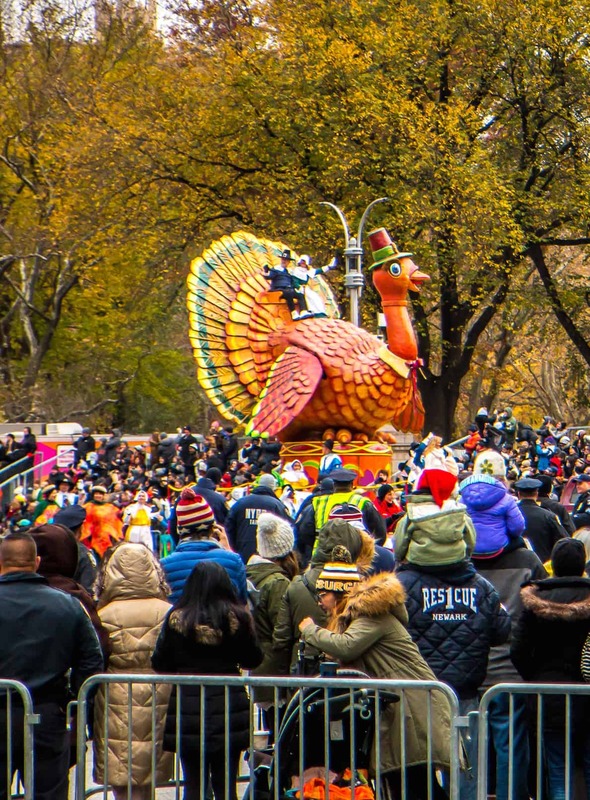 But the anticipation we felt while looking at the extravagant department store window displays was nothing in comparison to the excitement of waking up in midtown Manhattan at 6AM on Thanksgiving Day. I felt like a kid on Christmas morning! By 6:45 we’d made our way down to Columbus Circle to find the perfect spot to watch the 90th Macy’s Thanksgiving Day Parade. 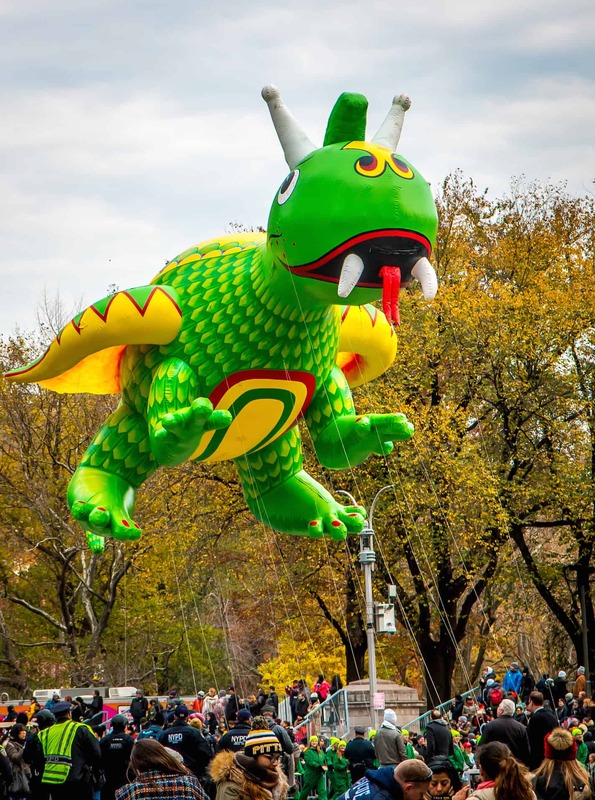 Although this year’s event was the 90th Macy’s parade, the Thanksgiving holiday tradition began back in 1924. 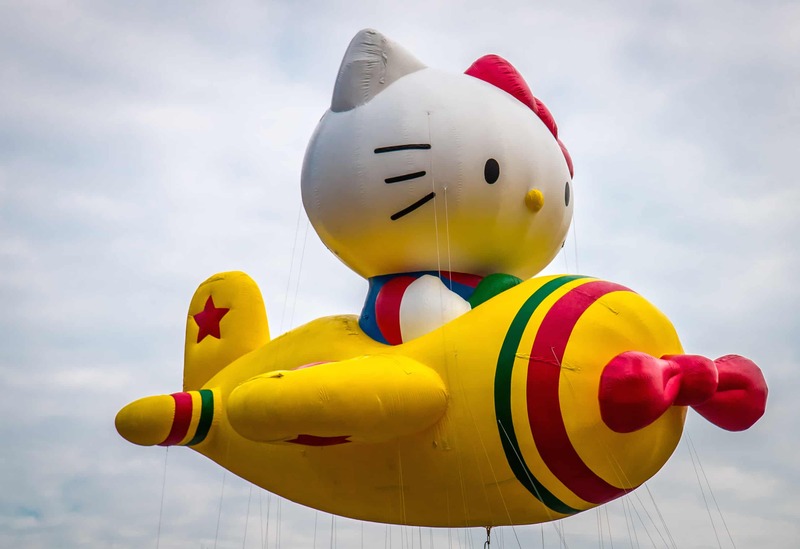 It was put on hold for two years during World War II because helium and rubber were in short supply. 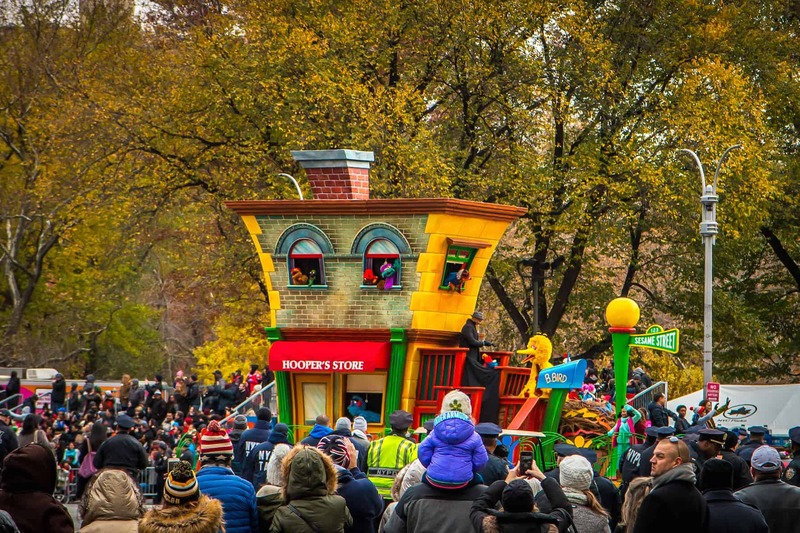 This year’s parade was considerably more expansive than the first one, featuring 16 character balloons, 27 novelty balloons, 26 floats, 1,100 cheerleaders and dancers, more than 1,000 clowns and 16 marching bands making their way down the 2.5-mile parade route. Columbus Circle (where we stood at the intersection of 59th and Broadway), is arguably the best spot along the entire parade route for taking photos. Since the balloons have to make a tight turn to head down Central Park West, everything slows down here, and the trees make a beautiful backdrop. 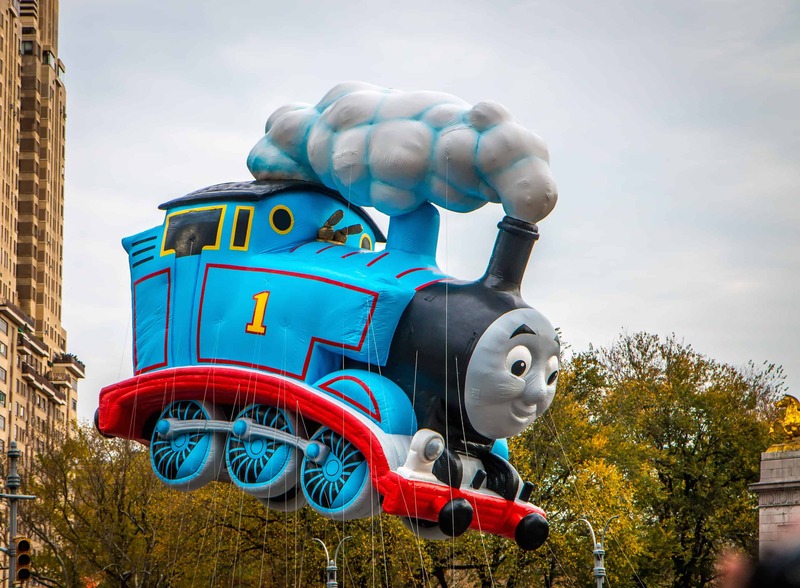 Most of the balloons this year were familiar characters from previous years, including Thomas the Tank Engine. 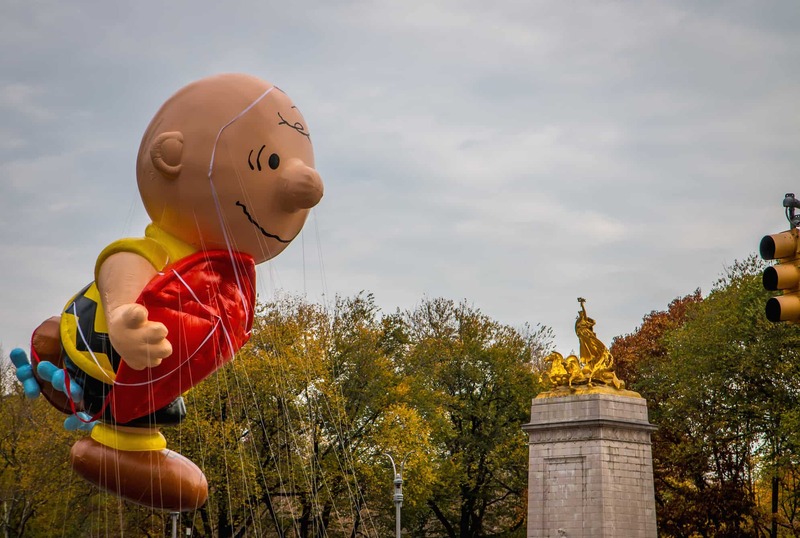 A brand new Charlie Brown balloon was unveiled to replace the long-running Snoopy balloon, with Snoopy, Linus and Lucy appearing as costumed characters on a Peanuts-themed float. There were other new character balloons this year as well, including one from the new movie Trolls, one from The Diary of a Wimpy Kid, and one called Trixie the Dog. 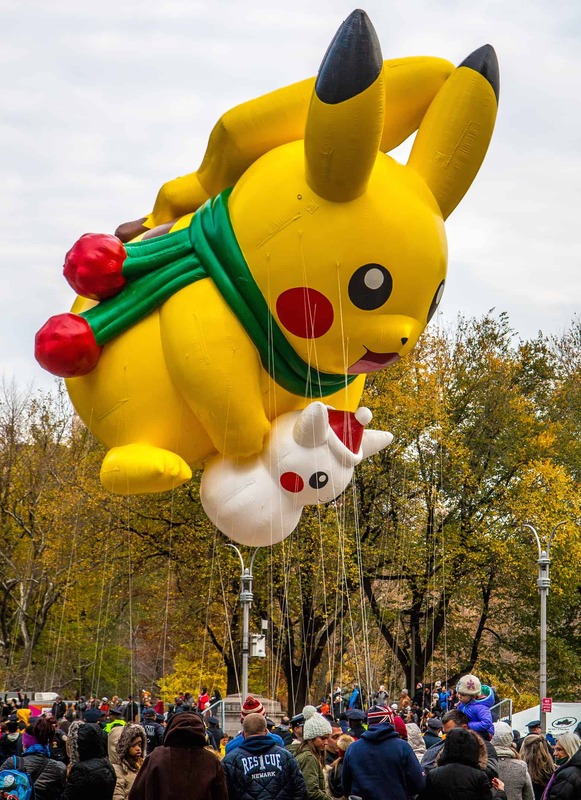 But old favorites like Pikachu and Hello Kitty got much bigger reactions. 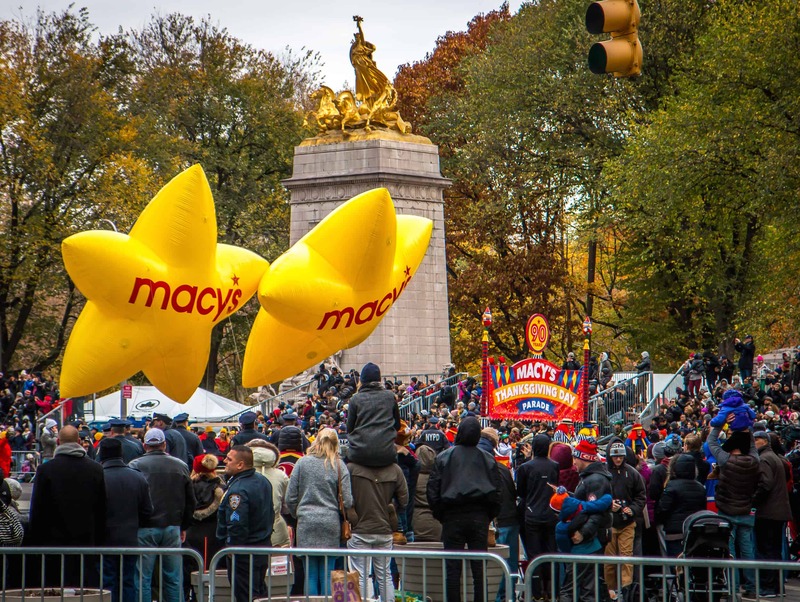 The most noticeable difference in the 90th Macy’s Thanksgiving Day Parade was the heightened security measures taken to protect the estimated 3 million people in attendance. Columbus Circle is one of the places where NYPD family members are packed into grandstands. So there were dozens of officers there, many armed with assault rifles or walking the route with bomb-sniffiing dogs. Every point of pedestrian entry was patrolled by numerous policemen. More than 80 sanitation trucks filled with sand were used to block off every intersection along the parade route, to prevent any possibility of car bomb attacks. Police helicopters regularly flew overhead. As a result, we never felt concerned for our safety. 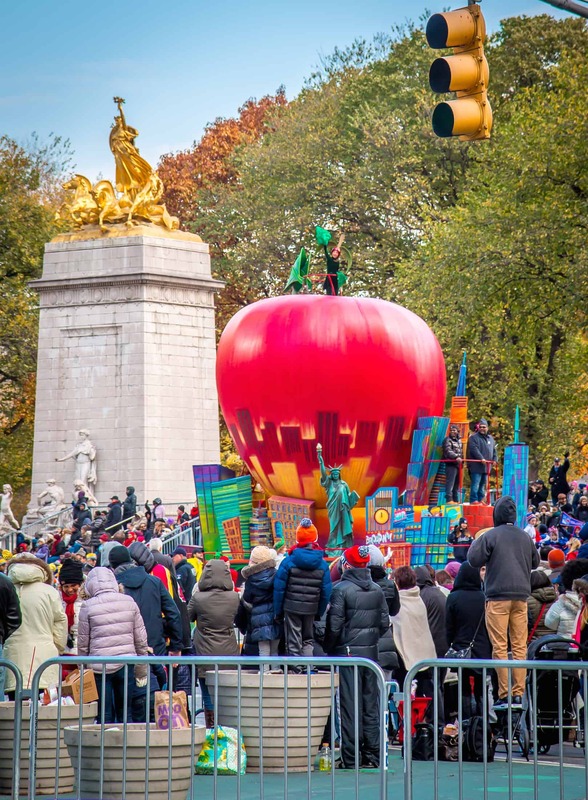 Though they didn’t perform while they were in Columbus Circle, the 90th Macy’s Thanksgiving Day Parade boasted the usual diverse array of celebrities. The Big Apple float (sponsored by NY Daily News) featured the members of De La Soul, one of our favorite ’90s hip-hop groups. 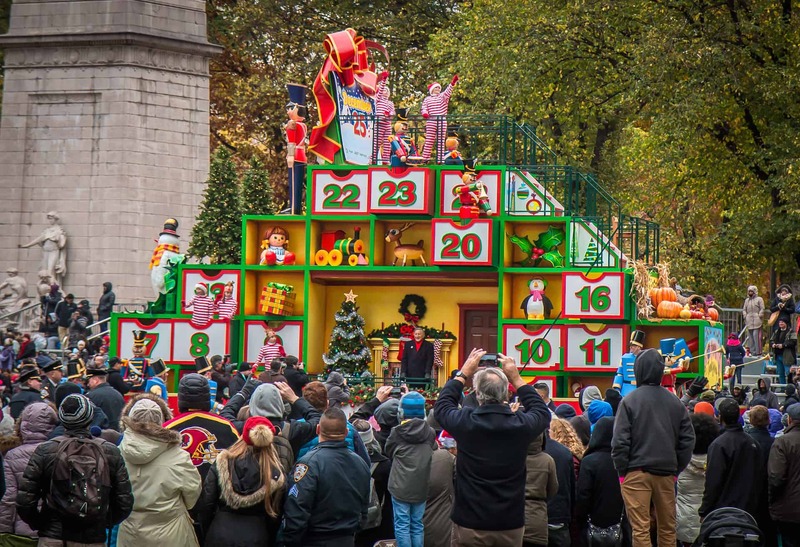 Legendary vocalist Tony Bennett (a New York native) proved a major crowd favorite, riding on the Hallmark Channel’s festive Heartwarming Holiday Countdown float. He later performed “Santa Claus is Coming to Town” with Miss Piggy, and narrowly avoided a fall thanks to help from the Muppets diva. With cloudy skies, a steady breeze and temperatures hovering around freezing, it had been a bitterly cold morning. Even with two pairs of sock and thermal-insulated gloves on, our extremities were freezing. We found ourselves dancing to every marching band, just to keep warm. 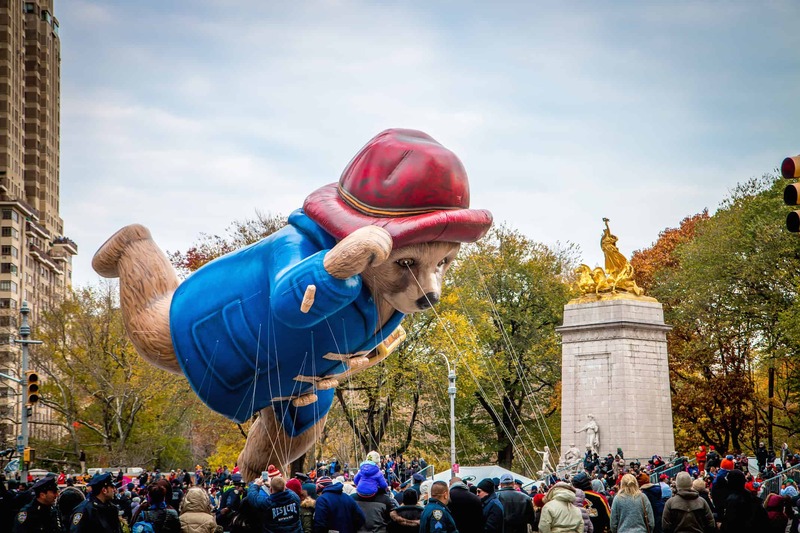 But as Ice Age character Skrat chased his beloved acorn down Central Park West and gave way to a small Turkey and Goose float, it signaled the end of the parade’s Thanksgiving-themed portion and the beginning of Christmas. 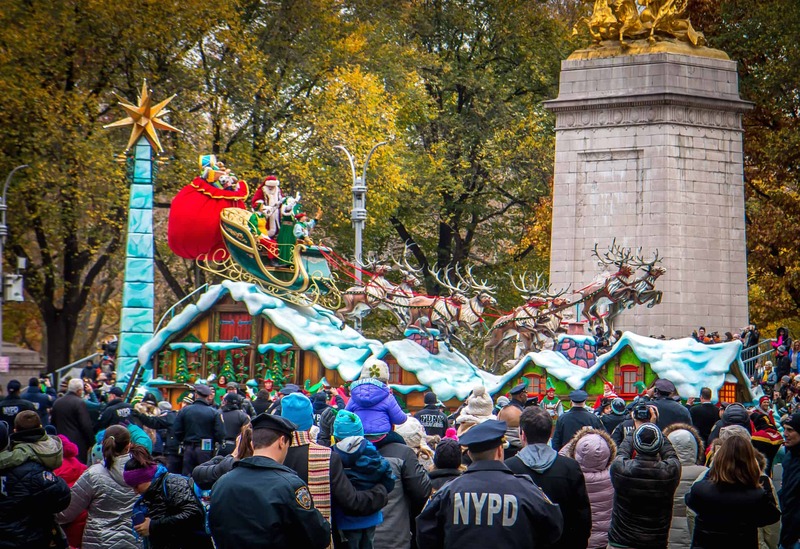 You could feel the crowd’s excitement beginning to build, knowing that Old St Nick would soon be there. 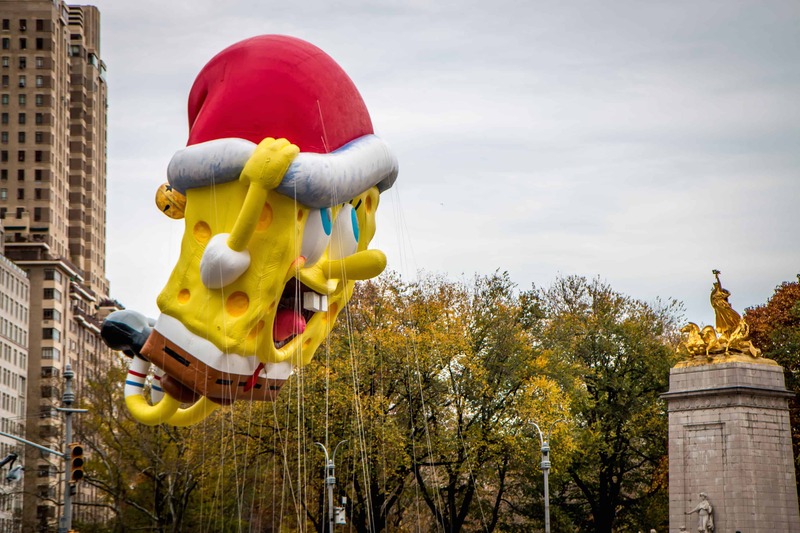 The Spongebob Squarepants balloon was arguably our favorite, his face mirroring the sheer joy on the faces of the children all around us. 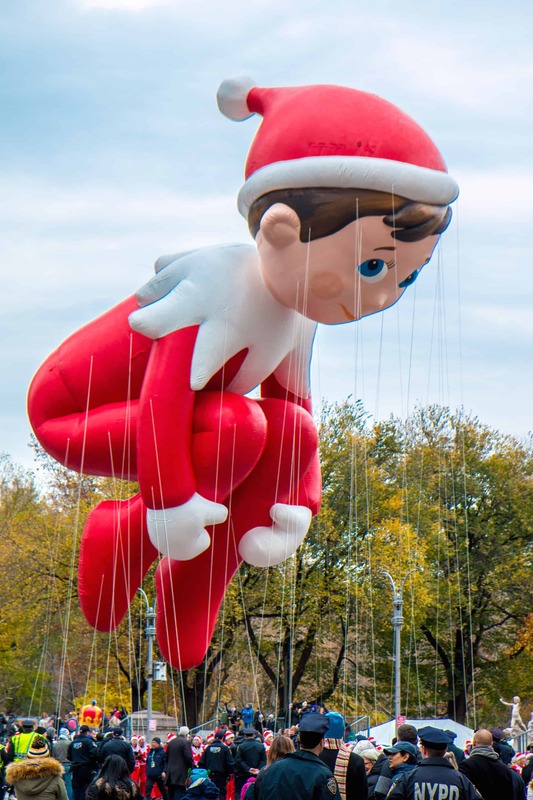 Knowing the 90th Macy’s Thanksgiving Day Parade would soon be winding down, we forgot all about our frigid digits, our four hours of standing without a bathroom break, our lack of sleep and our tired feet. There were tears in my eyes as I hugged Mary and my daughter close, wishing each other a Happy Thanksgiving and recognizing what a special moment this was. It’s a funny thing to make a dream you’ve had for four decades finally come true, and sharing it with the two most important people in my life is a memory I will treasure until the day I die. The co-founder of Green Global Travel and Green Travel Media, Bret Love is a journalist with over 21 years of experience. He’s been published in over 100 publications, including American Way, the Atlanta Journal-Constitution, National Geographic, Rolling Stone and Yahoo Travel. 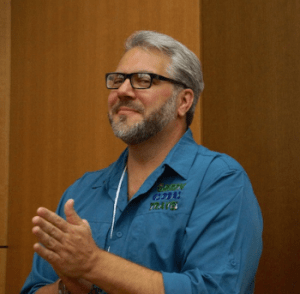 In recent years he has emerged as an in-demand public speaker and teacher, covering topics from branding and content marketing to responsible travel and how DMOs can work with travel bloggers. He’s also a prominent travel industry marketing strategist, managing content, social media and influencer marketing for companies such as Discover Corps and International Expeditions. Real Xmas Trees Vs. Artificial: Which Is More Eco-Friendly?